In the absence of government having a specific policy or structures in place to ensure that children and young people are involved in having a say in decisions that affect their lives, the restructure of local government and the transfer of planning to the new councils provided the opportunity to ensure meaningful participation with children and young people in local communities. NICCY believes that the Local Government Bill and its associated guidance on Community Planning is an excellent opportunity to establish a process where young people can play meaningful and constructive roles in the development and outworking of local community plans. NICCY have advised the DoE in the development of the Statutory Community Planning Guidance (section 6.8)and welcome the specific reference to councils having a particular responsibility to encourage and promote the role that can be played by children and young people in community planning . By including the specific reference to engagement with young people in the Statutory Guidance, the Department of Environment has established a benchmark for good practice within the Northern Ireland Government structure. You can read the guidance here. 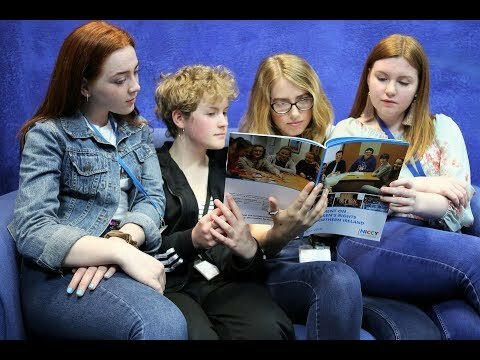 The delivery of Councils’ Community Plans. With this in mind, the Local Government Planning Department (within the Department for Communities) and NICCY agreed to work in partnership to organise the ‘Co-operation in Community Planning: Working with Children and Young People’ Conference in February 2018. The aim of the Conference was to raise awareness of statutory obligations under CSCA and to explore the roles and responsibilities of Statutory Community Planning Partners in the delivery of Community Plans as they relate to children and young people. You can read the Conference report and associated recommendations here (Word Document) (PDF Document). NICCY has asked for feedback on the recommendations from all Departments and from all Community Planning Statutory Agencies. Further updates on this will be provided in due course. NICCY’s Northern Ireland regional model of engagement was developed in response to the Department of Education’s consultation on the NI Network for Youth in 2008. Although the Network of Youth has yet to be developed the model has renewed relevance with regard to the regional engagement of children and young people and the outworking of Community Planning. There are real benefits for all: active involvement of children and young people will mean a more effective and user-friendly service and will also develop the skills and confidence of the young person and enhance the local community. Children and young people also have a right to be involved when adults are making decisions that may affect them (Article 12, UNCRC) as well as engagement being integral to a variety of government strategies. See link for further details on the benefits of engagement to organisation; to children and young people and to the community. For further information or advice, contact Ken Smyth (ken@niccy.org), or ring 028 9031 1616.